In 1938, the Saab factory was built in Trollhattan Sweden. At this time, they were not an automobile manufacturer. With World War II on the horizon, the Royal Swedish Air Force was in need of aircraft. On September 1, 1939 war broke out and Saab built bombers and fighters. The Saab factory was prepared for the task with two previous years of modernizing their production methods. These airplanes were mainly copies of German and American design. Saabs first in-house designed aircraft rolled off the line in 1941, the Saab 17. It was far from perfect, but the bugs were worked out quickly. A Bomber, Saab 18 was also produced. In 1944, seeing the close of World War II Saab began work on non-military aircraft. The Saab 90 and the Saab 91 were introduced, the 90 was a passenger plane seating 25-30, and the 91 was a small plane for private use. The rest of our timeline will outline only Saab’s automotive history. However, Saab to this date still makes the highest quality civilian and military aircraft not to mention trucks, buses, spacecraft and the famous jet fighter Viggen and the latest innovation Gripen. The Swedish Ur best translates as original and Ursaab was the Saab’s first prototype automobile. Project 92, so-called as numbers 90 and 91 had already been assigned to civilian aircraft, was agreed in 1945. Saab had decided that, with the Second World War ending, there would be a need to diversify away from military aircraft. Ideas included motorcycle s, cars, commercial vehicles and even fitted kitchens! Other Swedish companies, however, had the motorcycle market sewn up, Volvo already produced cars, and trucks were manufactured by Scania-Vabis. A Saab had to be the right size, type, construction and price – a small, affordable car. Thus, Saab had found its niche. 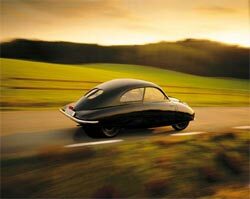 A 1:10 scale model Ursaab was tested in a wind tunnel by the Swedish Royal Institute of Technology and gave a drag coefficient of 0.32, an impressive figure even by today’s standards. Sister cars 92.002 and 92.003 were driven on every possible type of road surface and with 92.001; they have clocked up over 530,000km (approx 331,000 miles) – equivalent to 13 journeys around the world and typical of Saab’s commitment to thorough testing. Full-scale production of the Saab 92 commenced in December 1949, 700 of which were made. The engine was a 750cc two-cylinder two-stroke, transversely mounted ahead of the front axle. Saab engineers also created a safety cage for the passengers, to protect them in case of accident, one of the first cars ever designed for safety. Production cost was critical to Saab at the time and only 17% of the cost was from imported materials, hence the Henry Ford principle of any color you like as long as it’s… green in Saab’s case! Saab entered two cars in the 1950 Monte Carlo rally. Both finished the rigorous event. 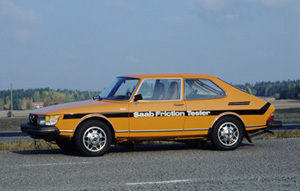 Saab continued active in rallying until 1980, when some factories began to spend so much on the sport that little Saab could no longer be competitive. The Saab 93 was announced in August 1955 in response to press speculation regarding the development of a three-cylinder two-stroke engine. The Saab 93 was the first model to be officially exported, primarily to the United States. 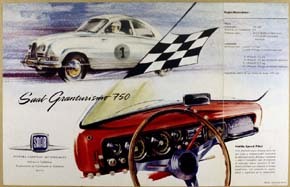 At the New York Automobile Show of April 1958, Saab exhibited a car that they called the Gran Turismo 750, a sporty and luxurious model that was pitched specifically at the growing US market. The GT750 had twin carburetors and the engine had been tuned to develop 50hp. It was the first model to have factory fitted seat belts. The Saab Sonett was unofficially known as the Saab 94, even though this number had already been assigned to an aircraft project. Only six Sonett were built, the cars being intended as either experimental or competition cars. The Sonett was much in demand by dealers and was shipped to the United States for the Saab introduction in April 1956. Saab unveiled the Saab 95 Station Wagon in May 1959. The early 95 had the two-stroke engine, but later models carried the Ford V4 engine (the V4 was an instant success). It was equipped with a four-speed gearbox. The last Saab 95 was manufactured in 1978.The Ford 1.5 Liter V4 engine delivered 65hp at 4,700rpm and saw 100 Km/h from rest in just 16 seconds. The new Saab 96 was revealed at a Stockholm press conference in February 1960. This model lived on until 1980 equipped with the V4 engine. The Saab 96 was for Swedes what the VW beetle was for Germans. Diagonally divided brake system with double brake circuits was introduced on all Saabs of 1964 models. Formula Junior was an international class for single-seat racers with engines from standard road cars. In 1960, some enthusiasts at Saab’s combined testing and competition department decided to have a go at Formula Junior, even though the engine was well below the permitted displacement of 1100cc.Taking an approach that was different to the conventional was not unusual for Saab and this case was no different. The engineers at Saab constructed an advanced monocoque car in contrast to the space frame designs of their competitors. The Saab 97 project based upon the MFI 13 made good progress. By the winter of 1966, it was on display earlier than expected, and in Stockholm, rather than New York as had been anticipated. The Saab Sonett II suffered increasing criticism of its awkward lines by both customers and within Saab itself. After just two years of production, Saab contracted the Italian stylist Sergio Coggiola to redesign the Sonett II. Coggiola had a tough task, forbidden by Saab to redesign the complicated central section. Saab board passed a resolution in April 1964, to develop a new and larger Saab. The Saab 99 was on its way. Despite widespread enthusiasm within Saab for the two-stroke engine, it was decided that a four-stroke unit was the only real choice. Without the means to embark on its own costly development, a contract was signed for Triumph to deliver a 1.5-liter (later 1.7 liter), engine to Saab. The joint engine design was to be inclined at 45° since Triumph was planning a V8 from the same basic engine design. The Saab engine was essentially half of a V8. 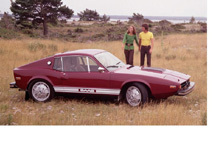 The Sonett III, the product of the Swedish-Italian cooperation, was unveiled in spring 1970. Two unique Saab innovations are presented on the 1972 models: an electrically heated driving seat and self-repairing (up to 8 Km/h, 5 mph) bumpers. The Saab 98 project began just two years after the production of the Saab 99 started. A new concept termed by Saab as Combi Coupé. Saab 98 never went into production, but the Combi Coupe did as a 99. 1976 The one-millionth Saab car comes off the line at Trollhättan in January. Catalytic converter and a lambda sensor are introduced on cars for the US. The first Saab 99 Turbo goes on sale as a 1978 model. This particular Turbo had great success in the Swedish Rally with Stig Blomquist behind the wheel. In 1979 the new 900 is released. Yet another world “first” is introduced with the 1979 Saab 900: the unique compartment air/pollen filter. Beginning with the 1983 models, Saab fits all its cars with asbestos-free brake linings. The Saab 900 was a model that spanned the entire 1980s, being in production for some fifteen years! During its lifetime over 900,000 units were produced, almost 50,000 of which were the successful and stylish 900 convertible. Despite being an evolution of the 99, the 900 was not merely a facelift. 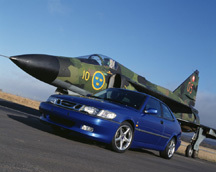 It had been given a new front section and Saab wanted to exploit new market sectors. This was especially true of the United States. Another product of the small but perfectly formed design department at Trollhättan, the EV-1 was a sport Coupé based on the 900 Turbo 16. The EV-1, or Experimental Vehicle Number One, was never destined for production. The front and rear sections of the EV-1 were constructed from Aramid reinforced fiberglass and had the ability to resume their original shape after impact. The toughest safety standards are satisfied with the lightweight carbon fiber side impact protection within the doors. Continuing the lightweight theme, the front seats are half the weight of conventional seats but retain electronic functionality including the ability to adjust the side supports. With the 0-100 Km/h in just 5.9 seconds, the performance of the EV-1 is comparable to some of the best sports cars. The Saab 9000 of the 1987 model becomes the first front-wheel-drive car to offer ABS brakes. Styled by Italian Giorgetto Giugiaro, the 9000, a front-wheel drive with a transversely mounted engine meant that the interior was more spacious than the Saab 900 despite a slightly shorter external length. The combination of the folding rear seat and the estate/saloon opening rear hatch made for superb load-lugging characteristics. The Saab 9000 was the only imported car, bar the Rolls Royce, to be classified by the United States authorities as a “large car”. 1986 On 7 October, three Saab 9000 Turbo 16s in guaranteed standard condition get off the mark on the world’s fastest racetrack, the Alabama International Motor Speedway in Talladega, U.S.A. 31 drivers take turns at the controls of the three cars, with stops only for refueling and service. In nearly twenty days of uninterrupted driving they break 2 world records and 21 international speed records. The fastest car covers 100,000 km at an average speed of 213 Km/h, the other 2 average around 210 and 208 Km/h. 1987 The two-millionth Saab is manufactured. 1989 At a press conference on 15 December, GM announces that it is buying 50% of Saab’s car operation. The new Saab 900 made its debut in front of the press and 35,000 residents of Trollhättan, in the town’s main square, in July 1993. The new 900 was the first completely new model since GM (General Motors) took a 50% stake in Saab Automobile AB in 1990. Saab is the first carmaker to present a Freon-free (CFC-free) air-conditioning system. In 1994, Saab introduces the first V6 engine in its 900 SE model. 1996 Ten years later Saab returns to Talladega, this time with six Saab 900s, absolut standard cars, powered by different engines: a 2-litre turbo, a 2.5-litre V6 and a 2-litre injection engine. They clock up 40 new international speed records. The fastest car, a 900 Turbo, turns in an average speed of 226 Km/h. The Saab 9-3 was launched in 1998 essentially as a re badge Saab 900. There was very little to tell them apart externally, except for a redesigned grill and the relocation of the third brake light from the boot ridge to the top of the rear screen. Internally, the 9-3 acquired the innovative SAHR or Saab Active Head Restraint system – as introduced as an industry first on the Saab 9-5. It was under the body that the changes had been made on the 9-3. Over 1,100 changes including suspension, in an attempt to tighten up the handling characteristics of its predecessor, the Saab 900. 1997, The new Saab 9-5 is presented in Trollhättan, and the three-millionth Saab is produced that summer. The development of the Saab 9-5 retained existing Saabisms such as its world famous attention to safety, the curved C-pillar and the ergonomics of the vehicle – especially in respect of the driver. Saab set out to exceed the already high safety standards of the Saab 9000 and design the safest car possible. Data from Saabs own tests and surveys from Folksam (the Swedish insurer), Euro NCAP and American HLDI all show that the Saab 9-5 is indeed the safest car that you can drive to date. Saab reintroduced for the 9-5, the return of the floor mounted ignition and reverse gear lock that was absent from its predecessor, the Saab 9000. Yet, another Saab innovation: ventilated front seats. It is the first time a passenger car, the new Saab 9-5, is offered with this feature. 2000, GM buys the reminder of Saab. In 2003, the completely redesigned 9-3 SS is released in US. 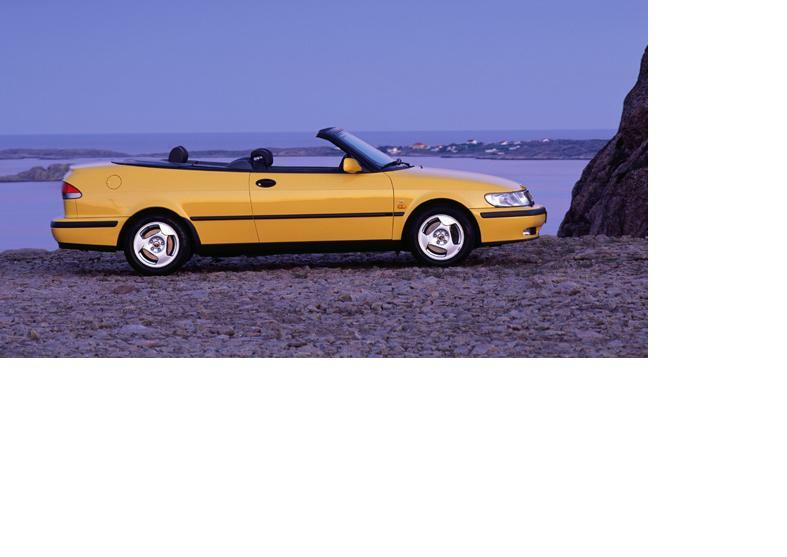 The new Saab convertible is scheduled to be introduced to the US market in the Fall of 2003 (Swedes have to wait until Feb 2004). It’s manufactured at the Magna-Steyr plant in Graz, Austria. It have automatic rollover bars that pops up from behind the rear seat, and the whole convertible frame is built out of Magnesium. What the future holds may be within what concept car 9-3 and prototype 9X shows, or the rumors of a 9-2 based on Subaru Impreza. First official photo of the new 9-2X planned for release on the US and Canadien market early 2004. The 9-2X is built by Fuji Heavy Industries, Japan; which GM holds a 20 percent stake in.